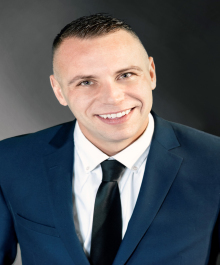 Kyle is your friendly easy to work with agent who always welcomes you with an open mind and honest smile. He understands the emotional excitement and stress involved with finding the house to make your home and will make you feel at ease right from the start. After growing up in Winneconne, Kyle has made Oshkosh his home, where he has chosen to raise his family for the past 12 years. He has attended UW Oshkosh and achieved promotions into management in his prior career because of his proven leadership skills. Give Kyle a call today to put him to work for you.